Product prices and availability are accurate as of 2019-04-23 02:23:05 UTC and are subject to change. Any price and availability information displayed on http://www.amazon.co.uk/ at the time of purchase will apply to the purchase of this product. Set up in Wolverhampton in 1908 the Viking brand has a record, rich in the custom from top premium street bikes and throughout the century. Top quality, fighting style and toughness possess constantly been the hallmarks from Viking patterns. 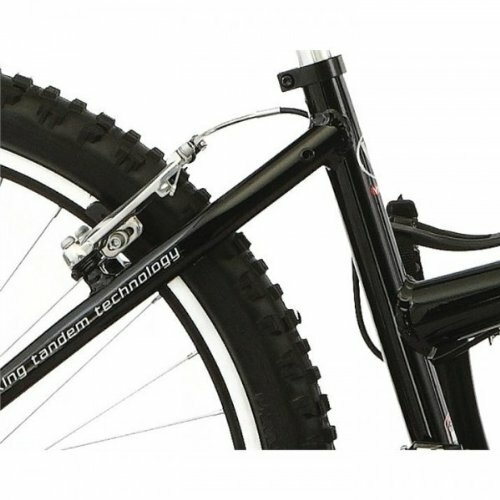 Constructed coming from huge aluminium tubing, mated to oversize forks to complete the rigours from path using. Model Type : Adult Aluminium Tandem. Frame Construction : Oversize Aluminium with rear disc mount, dual bottle cage bosses, rear mudguard bosses and replaceable dropout. Forks : Oversize 1 1/8" Hi-Ten steel with mudguard bosses. Frame Size: 17.5" / 15.5". Front stand over height 29". Rear stand over height 23". Wheel Size : 26". Gear System : Shimano 24 speed indexed gears with STI push button selection. Shimano Deore rear gear mechanism. Eccentric bottom bracket for correct chain tension. Alloy 170mm cranks. Shimano 11/30 8 speed cassette. Wheel Specification :Black alloy Viking rims with a front and rear solid spindle hubs. Shimano cassette. 26 X 2.35 blackwall MTB tyres. Brakes :Front and rear Tektro alloy V type brakes with Shimano levers. Levers have reach adjust facility. Handlebar and Stem : Alloy riser bars front & rear, with adjustable alloy rear stoker stem. Additional : Unisex comfort saddles with matching handlebar grips, 300mm alloy seat pins. Resin platform pedals with toe clips and straps. Weight : 19.8kg. Frame Colour : Platinum Silver. Fork Colour : Platinum Silver. Cycle Condition :Brand new sealed in box. This bike comes 90% built, fitting of pedals, stem/bars, front wheel, front brake cable & seat. Chain tension, gears and brakes will also require some adjustment.